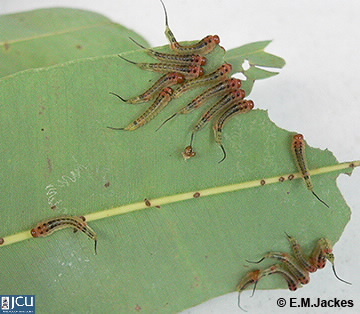 These sawfly larvae were feeding on Corymbia ptychocarpa (Swamp bloodwood). Distinguished by the two rows of dark spots along either side of the body and the fine tail. When disturbed they bend their heads and tails over the body. Eggs are inserted in the leaf tissue.